There's been a certain amount of CTC-bashing here of late, and also in other places. But I think CTC have a very difficult job to do. I really do. They have to be an "inclusive church". They have to reflect a very broad spectrum of views from within their ranks as to what cycling policy should be. This is in contrast to the position of the Cycling Embassy of Great Britain, which started as a movement of bloggers and cycle campaigners dissatisfied with the policies and performance records (in terms of improving cycling conditions and getting more cyclists on the roads) of existing organisations, like CTC, LCC and Cyclenation, and thus started from an ideological (in the best sense), not an inclusive standpoint. The Embassy doesn't have to reflect the views of those who disagree with it. They can just not support it, as they wish. Sorry, but I want to ride where I want when I want by whatever route I want. I totally disagree with CEGB's segregation policy. Have you actually seen what it's like in the Netherlands Andy? How you have a great choice of routes, and they're all safe. Segregating cyclists off the roads is victim blaming, restricts choice of route and panders to drivers 'owning the road'. After I retweeted his original tweet to my follwers, there developed an enormously long Twitter argument between Andy and others of the "Embassy persuasion". It would be too cumbersome to try to reproduce this here, and inappropriate, but I mention this for several reasons. One reason is that I know that this blog has quite a few Dutch readers. It is often very hard for the Dutch to understand quite what the "problem" is in UK cycling circles – to understand where the argument around separated infrastructure comes from in this country – and why cyclists here (and perhaps even more in the USA, Canada, Australia and New Zealand) can't seem to speak with one voice to government to demand clearly what they want. I would like them to be able to appreciate it, for the more they do, the more, perhaps, they will be able to help us. For Andy's views, which are not that unusual amongst UK cyclists, of course, embody a total, profound misunderstanding of the nature of the Dutch cycling solution, or paradigm, and a complete misunderstanding of what the Cycling Embassy and allied groups are campaigning for. Nobody holding these views can possibly have read thoroughly, and understood, the arguments advanced in this blog, or on the Embassy website, or on the Dutch-based English-Language cycling blogs A View From The Cycle Path (David Hembrow) or BicycleDutch (Mark Wagenbuur). 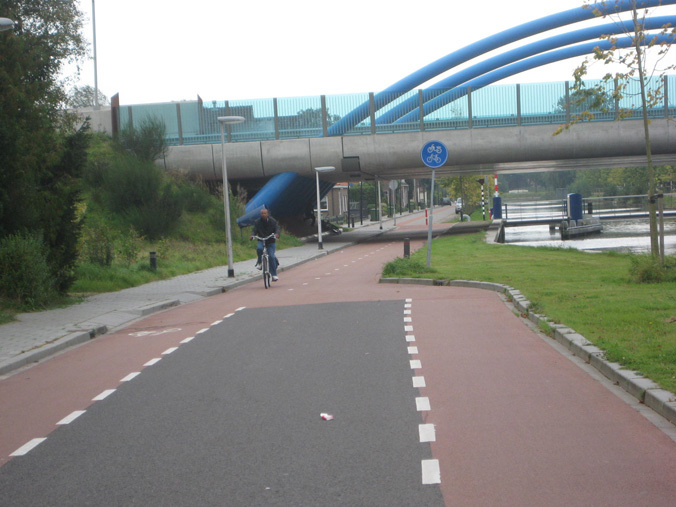 Moreover, they clearly can't have experienced cycling in the modern Netherlands themselves. Well I happen to know that Andy lives in Southend, Essex, which is just a shot train journey, or a 60 mile bike ride, from the port of Harwich (the ride would be partly on very dangerous and almost unavoidable trunk roads, of course, like the A120, for this is the UK). From Harwich one gets in one sea hop to the Hook of Holland, and from there, on wide, convenient, safe, fun, cycle paths, of course, to the rest of the Netherlands. I hope Andy makes that journey some time. Should our intrepid cyclist defy the sign and cycle with this bus and van [behind the noise barriers], he/she would simply find another set of traffic lights four hundred metres from this one. For a British cyclist to come to the Netherlands and say to a Dutch cyclist "How do you cope with being banned from so many roads?" is a bit like an American coming to the UK and saying: "You know that socialised national health system you have over here? Does it actually prevent you from doing open heart surgery on your grandfather in your garden shed if you want to?" Laugh Out Loud: the point being that both questions prove to be comically irrelevant to the person to whom they are addressed, who understands the national infrastructural and cultural background. 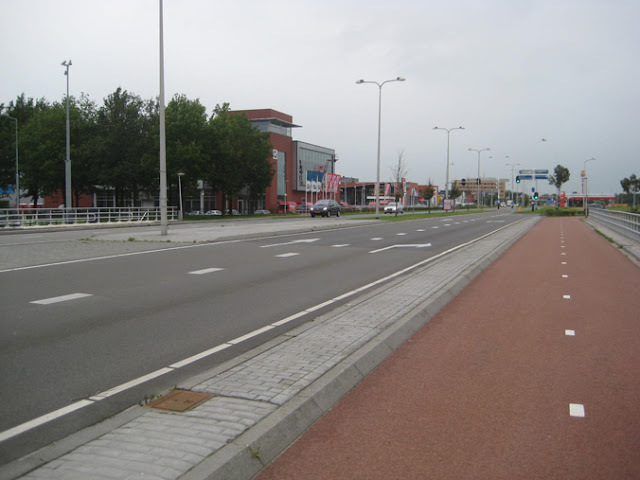 Sorry, "right to the road" freaks, but cycling is banned on this road in Assen because it makes sense to ban cycling here. The road is going into a tunnel under a railway, but the excellent two-way cycle tracks on both sides of the road make the ban completely irrelevant. But such examples, away from the motorway network, are rare. Though I don't know if he is member of not, the CTC clearly feels it has to accommodate the under-informed views of people like Andy. Hence, I suspect, their problems and contortions around policy. These have been extremely-well illustrated by the correspondence recently on a post of The Alternative Department for Transport blog, in which I and the two senior policy-makers at CTC, Roger Geffen and Chris Juden, have had their say. This is the kind of thing for which the CTC/DfT Hierarchy of Provision seems to find no place, the segregated but not shared-use cycle track alongside a road, in this case, Royal College Street, Camden, London. The Hierarchy of Provision is lifted straight out of DUTCH planning advice. 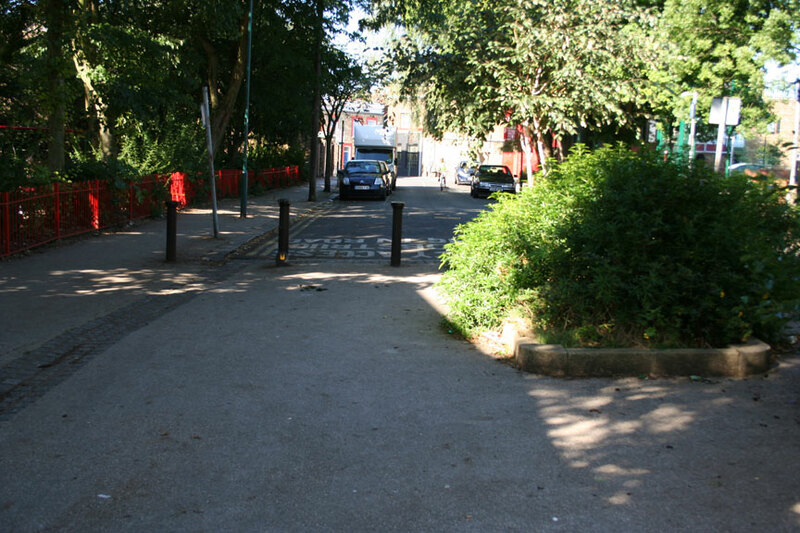 THEIR top priority is to create calm neighbourhoods where people can live, play, walk and ride bikes in safety and only drive motor vehicles with great caution. They call it a Woonerf. Outside the Woonerf, if the traffic speeds and volumes are low, they still don’t separate bikes from cars on quiet country lanes for example. Slightly busier low-speed roads get on-highway cycle lanes (a whole lot wider than UK ever provides of course), but Dutch PRIORITY is to make those roads less busy: interrupt them (not for bikes though) and send through traffic another way. All this is in Hembrow and Wagenbuur, but they concentrate on the separate sidepaths because that’s the most concrete difference between what they have and what we don’t have. No actually it isn’t. There’s something else, involving a whole lot more concrete that Hembrow and Wagenbuur completely ignore. The Dutch motorway network. 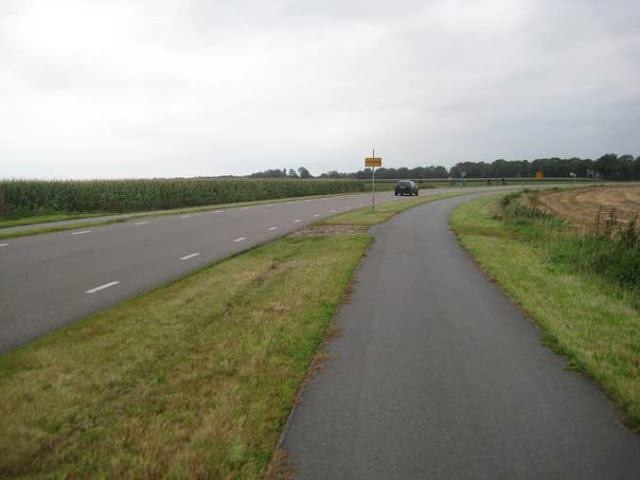 The Dutch can close roads to through motor traffic to create Woonerfen and reduce capacity on other roads to make room for high quality off carriageway cycle tracks because they have not been shy about building ring roads and motorways for the displaced traffic. Go onto Google maps and check out any Dutch city. I challenge you to find any part of any city that is more than 10km from a motorway or does not have a complete ring road. Now go look at London on the same scale. Or any British City. They all still depend upon general purpose roads to get traffic around through and out of the city, roads on ancient alignments that provide the line of least cycling resistance but intersect in maelstroms like Bow and cannot be equipped with good quality cycle infrastructure so long as so much motor traffic has to go that way too. It’s a problem for anyone who wants cyclepaths but opposes new road schemes, which is probably most cycle campaigners. It's hard for me to know where to begin in trying to answer Chris here. I can live (as I have to) with the odd correspondent on Twitter, like Andy Kewell, completely misunderstanding the Dutch paradigm, but when an almost equal incomprehension is displayed by a senior policy person at the UK's largerst cycling organisation, it is deeply disappointing, and it shows all too clearly why the Embassy had to be founded. So let's start at the beginning, and take this apart bit by bit. It's going to be a long process. The Hierarchy of Provision is lifted straight out of DUTCH planning advice. Words may have been copied, but nationally-specific understandings and assumptions often underlie simple words, and mislead. Clearly a massive misinterpretation has taken place in translation from whatever the "Dutch planning advice" was to its interpretation in CTC/DfT policy, as the Dutch do not "consider last" segregated cycle tracks as a solution for busy main roads which cyclists need to use. Such tracks are near-universal in the Netherlands now on such roads. THEIR top priority is to create calm neighbourhoods where people can live, play, walk and ride bikes in safety and only drive motor vehicles with great caution. They call it a Woonerf. Complete nonsense. The Netherlands is not some fairy-land dedicarted to "calm neighbourhoods where people can live, play, walk and ride bikes in safety and only drive motor vehicles with great caution". The Netherlands is a modern industrialised nation with everything any other similar nation has: high-speed roads, railways, tram and busways, industrial waterways and docks, and huge-scale industry, retail, and industrial agriculture. This is all accomodated by Dutch planning. It ain't a fairyland. It's a working and very economically successful country, surprise, surprise! But the overriding principle, where cycling is concerned, is separation from motor traffic. Anyone who spends any time cycling there can see that, and feel and experience it – whatever the CTC, or even contextually misunderstood Dutch planning guidance, say. Amusing cartoon, CTC, but let's have a bit less of the fairyland, and a bit more understanding of how it actually works in a real country only 127 miles away. True Woonerven cover a tiny percentage of the area of Dutch towns and cities. They are areas where the streets are dedicated to walking and play, the top speed is "walking pace", and they have nothing whatever to do with the facilitation of fast, efficient bike journeys on the high-quality, backbone cycling infrastructure, which will be elsewhere (though small cycle paths will always connect housing in the Woonerf to that infrastructure). They are not the normal or default treatment for residential areas either. There is a total misunderstanding here of the nature, scale, and role of Woonerven evidenced in Chris Juden's statement. This is serious transport infrastructure in the Netherlands, this kind of thing is a "top priority" there (to mimic Juden's language of claimed priorities) and it has absolutely nothing to do with woonerven. If you think this is not Dutch "top priority", consider, why was the canal on the right moved two metres sideways at vast expense to accommodate this cycle track? Outside the Woonerf, if the traffic speeds and volumes are low, they still don’t separate bikes from cars on quiet country lanes for example. Actually, they do if they need to! Go and look. It depends what you mean by "quiet", of course, but, if there is demand, if it is an important road for cycling (especially for children to cycle to school on) and there is, by UK standards, any significant motor traffic on it at all, they separate. Everywhere. There's only a few cars a minute on this country road near Assen, but that's enough to warrant separation with cycle paths. Slightly busier low-speed roads get on-highway cycle lanes (a whole lot wider than UK ever provides of course), but Dutch PRIORITY is to make those roads less busy: interrupt them (not for bikes though) and send through traffic another way. No it's not. Dutch priority is to separate cars and bikes. Go and look and experience. Juden is confusing several classes of solution here: cycle lanes on roads that have significant traffic (usually in suburbs, where the roads have not yet been rebuilt to the latest fully-segregated standards), cycle lanes on roads that have nothing except a small amount of essential access traffic on them (usually in town centres), and cycle lanes on "bicycle roads" that have to provide access to a few residential properties as well, and are there to emphasise the "cycle priority" aspect of the road. In all cases it's not about "making roads less busy" in the sense in which that phrase would be understood in the UK context. It's about reliable, full separation. Here's a "bicycle road" with cycle lanes that turns into a totally car-free cycle path. It is only not totally car-free for the section in the foreground because it provides access to some houses, but it's virtually as good as if it were, and the advisory cycle lanes indicate cycle priority. I've already dealt with this one. (But I am not sure why Juden adopts the American terminology, from Forester, of "sidepaths". We call them "cycle tracks" in the UK.) It makes no sense to call something a "last resort" where it is the automatic, univeral solution for a certain type of road. To put it like this, in English, and in the British context, is simply misleading. The whole concept of a hierarchy of provision makers no sense, from this perspective. Decisions on appropriate solutions for any road have to start from a decision on the function of a road, not from a universal template hierarchy. The Netherlands is a modern industrial nation, as I have said. It needs big, fast roads for transport. Sometimes, as in the UK, these have to coincide with the only available cycle route, for reasons of geography or history. 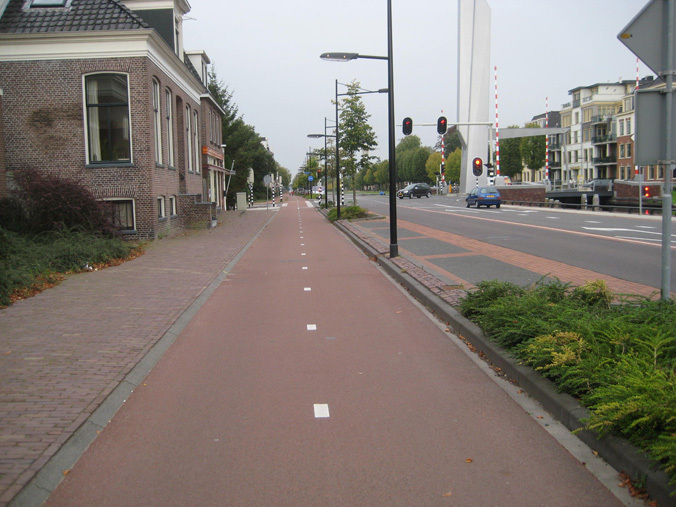 The difference is that the Dutch always provide the high-quality cycle track, the British almost never do. A cycle track like this on a major through-road like this (between Assen and Groningen) is not a "last resort" in the Netherlands, it is the only solution that is used in these circumstances. Over the last few decades, the Netherlands has unwoven the networks of car and bicycle routes. If you compare routes for the same journey by bicycle and by car, then in very many cases you will find that the two routes are very different to one another. Again, the over-riding policy is the separation of bikes from motor traffic, whether its through cycle paths, cycle lanes, cycle tracks, cycle roads, or separated routes that use a whole battery of measures in their completion. No, Hembrow and Wagenbuur don't ignore motorways. You can search A view from the cycle path again for references to motorways, and a huge number of illuminating articles come up, often on topics most British cyclists would never have thought about, such as how noise from motorways is kept away from cyclists (and residents). And you can read BicycleDutch's explanations of how cyclists are guided through, over and under motorway junctions and networks. But once again, here, there are errors and misinterpretations in terminology leading us astray. For while the Dutch do have the huge roads that we in the UK call "motorways", of course, most of their "motorways" are not this. They are the equivalent of a certain type of British A-class road. The Dutch do not have an equivalent category of road to the UK "A" road, because the UK's category would be too broad for them, covering, as it does, such a vast range of road-types, from six-lane, "motorway-in-all-but-name"-type trunk roads, through densely-active shopping streets in towns, down to heavily-trafficked two-lane country lanes and little-used single track roads in remote areas such as the Scottish Highlands. The Dutch have built the bypasses and ring-roads as the British have. But they did something crucially different at the same time. They made motor traffic take those new roads, and didn't leave the old roads open, without altertation, in the fatally-flawed way that the UK did, so just adding motor capacity. At the same time, Dutch planning, over many decades, separated roads by their function, so those roads defined as "motorways" (which need not be very wide roads) were specialised only to take through motor traffic, not to provide direct access to shops and schools and workplaces. The category of "access roads" was developed to do just that, provide that access, but not to transfer traffic at the same time between districts. The doctrine of the mono-functional road became part of the framework of sustainable safety, and cycle networks were enabled in large part by the removal of much traffic from roads defined as outside the motorway network by this ongoing programmne of the separation of functions of the diffrerent classes of road. The process is not complete of course, and is not perfect. But it has created "main roads" strikingly different from their UK equivalents, where so many functions are attempted to be accommodated on such roads simultaneously: through-traffic movement, access to shops, schools and businesses, bus routes, cycle and pedestrian routes. 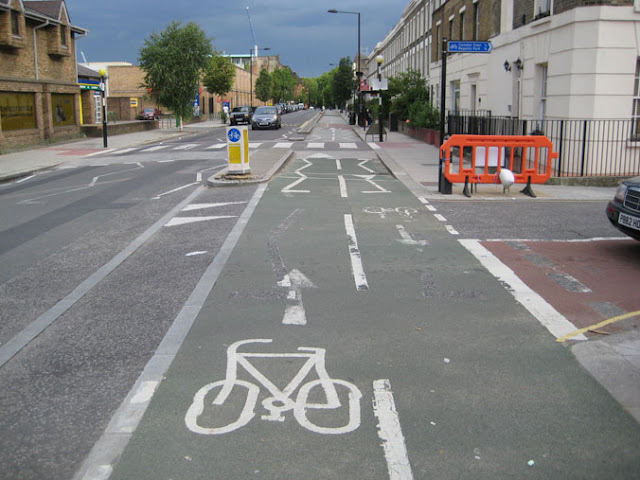 The DfT website has this picture as a banner on their "roads" pages as I suspect illustrating something they think well-designed, but it's a typical British multi-functional road (The Cut, London SE1), attempting to do too many jobs ineffectively. So nearly everything now seems to be different in the Dutch road and street fabric from how it is in the UK's. It is hard to adequately summarise the differences in a short essay, and, again, I urge everybody to go and see it for themselves. The huge contrast, with so many things being different at once, poses a challenge of interpretation and explanation to UK audiences, and it becomes remarkable to reflect that these nations are only separated by 130 miles of sea. People like Juden are confused because so much is different, and they pick out certain things which they think are critical differences, when they need to better interpret the whole. I challenge you to find any part of any city that is more than 10km from a motorway or does not have a complete ring road. Now go look at London on the same scale. I do so, and I find that because of the separation of functions on Dutch roads, large and small, and the differences of road definition, this is not a meaningful challenge. There are places in London more than 10km from a motorway (but not my house, which is 2km from the M1). But they are not more than 10km away from a road that Dutch planners, in all probability, would have re-interpreted and planned as a "distributor road", gradually removing its direct access functions, over time, had they been in charge here since 1950. So we've got a long-term planning challenge here, of that there is no doubt. I am certain that we will never make the UK's roads quite like Dutch roads. It's a different country, and differences, including some major differences, are certain to always remain, for reasons cultural, topographic, geographic, economic and political. But we could start to take parts of their best practice and interpret them as best we can into what we have. As I have seen done in some of the very different cities of Italy, Switzerland, and Germany, and has no doubt been done in many places that I haven't visited. To start with, we need to stop so strenuously finding reasons "why it can't be done here". Come on, CTC, let's have some vision! 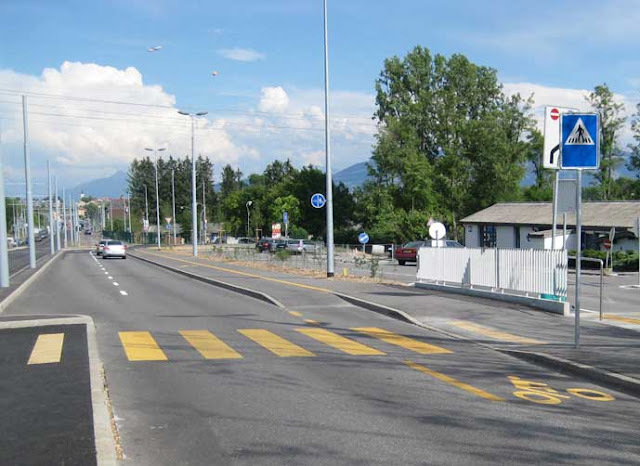 Segregated cycle track on main road, near Geneva, Switzerland. It's not flat here. And it's not Cycletopia, but it's much better than the UK. Last Tuesday's meeting of the London Assembly's Transport Committee, which included its second session examining cycling safety, was quite fascinating. The previous session had allowed a considerable number of people to have their say, including representitives of the LCC, CTC, British Cycling, and the Cycling Embassy of Great Britain (including me). In this second session the speaking guests were restricted to a few "experts": Dr Rachel Aldred, Director of the Sustainable Mobilities Research Group at the University of East London; Karen Dee, Director of Policy at the Freight Transport Association; Ben Plowden, Director of Planning for Surface Transport at TfL; Steffen Rasmussen, Head of Traffic Design, Municipality of Copenhagen; and Roelof Wittink, Director of the Dutch Cycling Embassy. To have had these two last mentioned addressing the Aseembly Members was I think particularly remarkable. For people like me have been saying to London local government for decades that we need to get some experts from those European countries where very high cycling rates have been achieved to explain to us what is actually needed (if not to put them actually in charge of making the necessary changes, which would be even better). This was the first time, to my knowledge, that something like this has actually happened: that any level of UK Government has sought advice on cycling from experts from the continent. This is a very welcome and long overdue development. The exchanges can be heard on a (very long) webcast available on this page*. Another blogger has already commented on the contribution to the debate of Richard Tracey, Conservative AM. I'm not going to give a full account of the session here, but I've transcribed, in a very approximate style, missing a lot out, but keeping, I hope, a fair essence of what was said, a few points that I felt were highly significant from around the 1 hour 50 minutes mark to the 2 hours 10 minutes mark. In this section of the debate, Assembly Members were asking the experts about trends in cycling levels and cycling safety in London and elsewhere, and about the concepts of "Critical Mass" and "Safety in Numbers". Ben Plowden, questioned at length on the London statistics, had held to the the view that safety for cyclists in London was getting better over time, taking into account the increasing number of cyclists, with the particularly large number of deaths last year (16) being possibly only a statistical "blip". In the Netherlands there's been a growth in cycling, but there hasn't been a comparable growth in casualties as there has been in London. Could you say something about that? Cycling grew in the 70s and 80s because of our policies, and safety increased along with it. It has to do with the level of cycling but also with the measures that you take. Do you put it down to a critical mass of cyclists on the road? That's a very important explanation, but, also, if you move people from driving to cycling, you have fewer people causing the troubles for cyclists on the roads. Segregation where you have more than 30km/h is very important. We also disconnect the main routes for cyclists from the main routes for cars, so you have less intersections where you have both high volumes of cyclists and high volumes of cars. I had a look at some your roundabouts, some kilometres from here. The roundabouts we have in the Netherlands slow drivers down but your roundabouts allow drivers still to have a speed of 40km an hour – that's really impossible for cyclists. There might be something about a critical mass of cyclists, we need more reasearch on the issue of critical mass, I don't know of any research specific to Europe. Infrastructure is extremely important, and we have a lot of work still to do in the City of Copenhagen. You expect trends in deaths to get better year on year because health care gets better, but when you compare modes, you see it's becoming safer year on year for those in cars, but for cyclists the improvement is much less. I think it's important to compare casualty rates for different modes of travel. 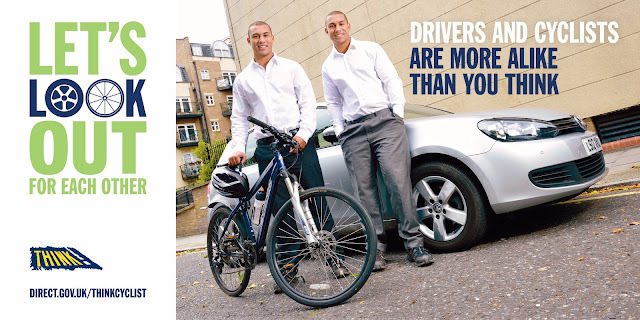 The casualty rates for London per kilometre is 30 times greater for cyclists than for car drivers. That's a very big disparity. Comparable figures from the Netherlands (from SWOV) gives you a figure of 4 to 1. It's around 25 to 1 for the UK as a whole. There's an issue there, as we are trying to get people to switch from cars to cycling. In the Netherlands last year there were 4 right-hook deaths in the whole of the country, with their much higher cycling rate. They are doing something much better. I want to say something about "Safety in Numbers". This idea has been much discussed. A paper by Jacobsen in 2003 was the original use of the term "Safety in Numbers". He used five data sets, but three of them are cross-sectional, so there is a methodological issue; you can't tell whether you are getting the number of cyclists from safety or the safety from the number of cyclists, because it's at the same time. He used two other data sets that are longitudinal that give you a better insight into that. One of them was from the Netherlands, where he found as you got more cyclists, you did indeed get safer cycling, if you look at at a time series. Interestingly, the other data set was from the UK. He found but data for the UK was very different. It was all over the place; it wasn't showing a consitent improvement in safety related to the number of cyclists. I could talk about this at much greater length than I think you want to hear. There are many mechanisms likely to be going on. I don't think you can say more cyclists always leads to safer cycling. There are different mechanisms going on. It depends on the culture, the infrastructure, the legal context. Could it be that the cycling rate is still too small in London to make a difference, we haven't reached that critical mass where the risk becomes acceptable? What is an acceptable risk level is decided socially. Do we say that at 1%, 2% 5% cycling it gets acceptably safe? It's confounded because as you get more cycling you get more pressure for better cycling conditions, so that will feed into safety. There's a lot of things going on. I've been cycling in London for many years. You used to see hardly any other cyclists on the road, but it's very different now. I think you can get a "virtuous circle" where you get more cyclists, and improved behaviour by road users, leading to a "tipping point" where things change significantly. Now I see in some places 40 cyclists at every cycle of the lights. That must be having an effect on people's perception. I think it is worth noting that Jacobsen's original idea of "Safety in Numbers" was in terms of presence on the roads, not in terms of a log-term cultural shift. In Grays Inn Road, when you've got 40 cyclists around you during rush-hour, it might be relatively pleasant, but late at night, when there are no other cyclists on the road and the traffic is flowing freely, it's a very different experience. You need continuity and consistency. So, to sum up, it seems that the Director of Planning responsible for cycling in London, and perhaps the Green Assembly Member, expect cycling to automatically become safer as more people do it. On the other hand, those who have studied the subject in detail, and have real experience, know that cycling has to be made safe though the provision of infrastructure that separates cyclists physically from dangerous and intimidating motor traffic. Personally, having studied the Netherlands, I think there is such a thing as a "critical mass" of cyclists. But it is something quite different to what all these people are thinking of. It is a phenomenon that occurs far further down the line of cycle growth than the regime they are considering. It's not at 2% modal share, or 5%, or 10%. And it's not a physical, "presence on the road" thing, it's the political phenomenon that Rachael Aldred alluded to. It's the "Dutch Effect": what happens when you have, probably, more than 51% of the entire population cycling regularly: a point that was passed in the Netherlands long ago (it is possible participation has never been below this level in the last century). When you are in this happy situation, absolutely anything is possible for cycling. No expense is too great, no rearrangement of the urban or rural fabric too extreme to be worth doing for the comfort and convenience of cyclists, because virtually everybody wants it, there is little controversy about it, it is accepted, rather like massive state funding of health, railways, and roads for cars are accepted and non-controversial in the UK. 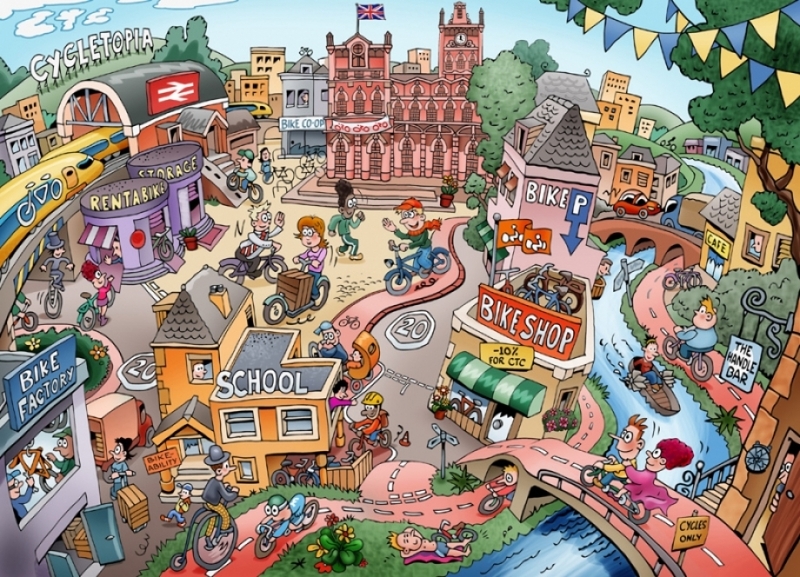 I think that until we reach that happy state, politicians who wish for more cycling are going to have to be very pro-active and visionary. It will be vain for them to hope for a magical "tipping point" at some far lower level of cycling uptake, where it will all become easy and semi-automatic. It won't be like that. It will always be a struggle. ETSC rightly recognises though that you cannot measure cycle safety simply by looking at casualty numbers. Comparisons should be based on the risk of a casualty per mile cycled (or per trip, or per hour – but at any rate, it should be relative to some measure of cycle use). Otherwise you fall into the trap of claiming that Dudley and St Helens are far safer for cycling than Cambridge(! ), or, even more absurdly, that Britain is far safer than the Netherlands (as Road Safety Minister Mike Penning claimed in Parliament), simply because places with low cycle use obviously have fewer cyclist casualties. That doesn't mean they are "safer" - indeed, CTC's "Safety in numbers" evidence shows the exact opposite. ETSC then shows that Britain is one of only 3 EU countries to measure cycle use at the national level on an annual basis – the others being (you guessed it!) Denmark and the Netherlands. Two others, Sweden and Norway, also measure it reasonably frequently. ETSC compares cycle use and cycle safety in these five countries and, once again, finds clear evidence of the “safety in numbers” effect: cycling is safest in the places with highest cycle use. CTC has documented this relationship in the past, based both on a comparison of EU-wide data from a wider range of dates, and of figures from within Britain. However, until now our only source of comparable data on local cycle use within Britain was the national census, which only comes out every 10 years and covers cycle commuting only. It was good enough to show the “safety in numbers” relationship exists, but not to compare how local authorities are actually performing. Unsurprisingly, ETSC’s report shows that Britain is performing worst of the 5 countries in their comparison, in terms of both cycle use and cyclists’ safety. But hey, at least we are measuring this! Also in Holland they have safety in numbers. Sam said if we could just get more people cycling in Britain then everyone would become as safe as in Holland. Sam then showed a very interesting diagram showing how safety in numbers works in Holland. Here we see a typical Dutch street scene where a lorry driver pauses before turning. 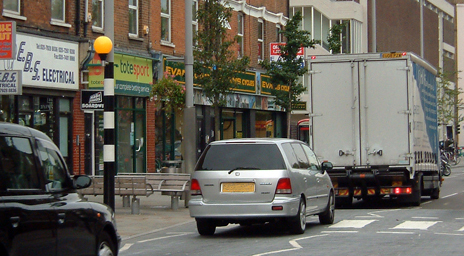 Dutch lorry drivers are used to being surrounded by lots of cyclists, which is why they take extra care at junctions. Is Roger Geffen of the CTC the only person in UK cycle campaigning who still believes in the simplistic nonsense of "Safety in Numbers"? *Unfortunately the GLA website uses a Windows Media format for its videos that doesn't normally play correctly on Macs (it may be silent). The solution I have found is the free, open-source program VLC, which does play these videos correctly on the Mac.